Photographs along the route of the old Great Central Railway through Leicester showing its present state and the considerable remains. Leicester Central Station before the recent start of redevelopment. The Great Central Railway through Leicester closed in 1969 - This site shows photographs of the current state of the route through Leicester. Additionally, for comparison, a section is included showing older photographs of the Great Central Railway between Rugby and Nottingham. A celebration of 50 years of both the Belgrave and Birstall Action Group (BBAG), who tried to save that station, and the Leicester Industrial Locomotive Group (LILG), who saved one of the first locos to run on the preserved Great Central – 0-6-0ST Lamport No 3 will be held on Sunday 18th August 2019, based at Loughborough Central station. Further details can be found here (pdf). Leicester North - From Leicester North station southwards to Thurcaston Road. Abbey Lane Area - The line from Thurcaston Road to the North Viaduct which runs parallel to Abbey Lane. North Viaduct - The viaduct from just north of the River Soar to Leicester Central Station. Leicester Central - Leicester Central Station. Braunstone Gate - Around West Bridge and Braunstone Gate. Goods Yard - Past the sites of the Goods Depot, Loco Shed, and chord to the Midland Railway’s Leicester to Burton Line. Aylestone - Southwards through the outskirts of Leicester. Old Photographs - Old photographs from the 1960s to the present of trains and buildings on this part of the Great Central. March 2019 - Plans have been published to replace the remaining viaduct in Braunstone Gate with student accommodation. December 2018 - The bridge over All Saints Road has been refurbished. June 2018 - The frontage of Leicester Central station is being modified as part of the redevelopment and there is an archaeological excavation around the viaduct foundations at Soar Lane. May 2018 - As part of the redevelopment of the remaining station buildings, Great Central Street has been blocked off in front of the station and scaffolding was being erected on the front. October 2017 - Planning permission has been granted and work has started to redevelop the remaining station building and parcels building. July 2017 - Added new page Old Photographs: Last Day & Demolition with photographs of the last day of passenger services at Leicester Central, its demolition, and photographs around. April 2017 - Added new page “Bridging the Gap”, with photographs of the construction of a bridge over the Midland Main Line in Loughborough. March 2017 - Added photograph looking down on the site of Leicester Central viaduct. January 2017 - Updated the photograph of the Leicester Central viaduct panorama, now with the student accommodation high-rise. April 2016 - Added scan of old postcard showing the original frontage of Leicester Central station. March 2016 - Added new page Old Photographs: Leicester in Colour with photographs of Leicester Central Station from Phil Herrick. December 2015 - Added an interactive panorama photograph of the Leicester north viaduct, taken on 18th November 1973, to the Old Photographs section. Spring 2015 - The whole route covered by this site has been re-walked and the photographs have been updated where required. Autumn 2014 - After an extensive archaeological excavation a large area at the back of Leicester GCR station is being redeveloped with student accommodation. January 2014 - Added new page in the Old Photographs section of a Brakevan trip from Nottingham to Ruddington. A historic set of photographs generously provided by Steve Richards. March 2013 - Announcement that the section of the viaduct that was to the south of the Bowstring bridge has been sold for demolition and redevelopment. December 2012 and March 2013 - added photographs of the start of construction of the NET tram extension over Nottingham station to the Old Photographs of Nottingham page. January 2012 - added updated photographs to the Braunstone Gate page and the Goods Yard & Engine Shed page. 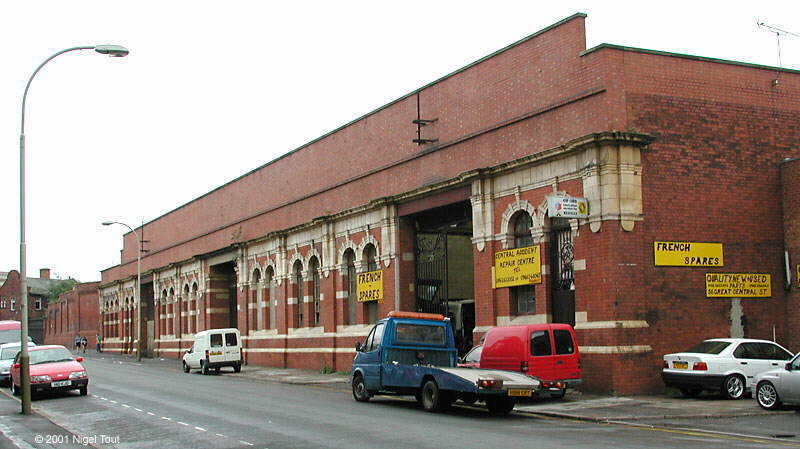 August 2011 - Plans to demolish the GCR Wagon Repair Shop on Upperton Road have been revealed. December 2010 - Demolition of the viaduct to the north of Braunstone Gate is under way. September 2010 - A commemorative plaque was put on the wall of The Bowstring restaurant, opposite the site of the bowstring bridge. May 2010 - The former power house in the goods yard has been converted from a pub to a Tesco Metro store. February 8th 2010 - Added photographs to the Old Photographs section of Ruddington station site and East Leake goods yard site in 1984. December 12th 2009 - Split the Old Photographs: Leicester Demolition page into two pages since it was getting too long. Moved the photographs of the Bowstring bridge and its demolition from the Braunstone Gate page to the page Old Photographs: Leicester Demolition 2. December 1st 2009 - Demolition of the Bowstring bridge on Braunstone Gate is complete. November 21st 2009 - Added photographs at the site of Ruddington station in 1975 to the Old Photographs section. November 17th 2009 - The section “Old Photographs - Leicester Central” has been split to give new section “Old Photographs - Around Leicester”, and photographs added including the viaduct alongside the “Pump & Tap” pub when it was the “West End Inn”. November 14th 2009 - Demolition of the Bowstring Bridge in Braunstone Gate is well underway. October 2009 - Leicester City Council have announced that work on demolishing the Bowstring Bridge is scheduled to start from October 5th. August 2009 - Leicester City Council reported that it will remove the Bowstring Bridge in Braunstone Gate as soon as possible. May 2009 - Updated the photographs around Upperton Road. September 2008 - Added more and larger photographs to the Old Photographs Section. May 2008 - Added link to a YouTube video of steam around Leicester Central. December 2007 - Regeneration has started around the viaduct at Leicester Central Station. November 2007 - Added link to the campaign by Leicester Civic Society to save the Bowstring Bridge in Braunstone Gate, Leicester. October 19th 2007 - Demolition of Upperton Road viaduct has started. March-October 2007 - The ground under Upperton Road viaduct is being cleared in preparation for the temporary diversionary road which will be used while the bridge is demolished. March 2007 - The removal of Upperton Road viaduct has been given the go-ahead. March 2007 - The city council has approved planning permission for the regeneration of the area between the river and the Great Central Leicester station viaduct. December 2006 - Photographs of the construction of the new chord from the GC to the Midland added to the Loughborough page, a photograph of the bridge over Station Street added to the Nottingham page, and more photographs of shunting in the Leicester goods yards added to the Trains page, all in the Old Photographs section. September 2006 - Photographs of the bridge over Railway Terrace added to the Loughborough page of the Old Photographs section. August 2006 - More photographs added to the Nottingham page of the Old Photographs section. July 2006 - Money has been allocated for the replacement of Upperton Road bridge. May 2006 - Added new West Bridge page to the Old Photographs section, with photographs of the viaduct there around the time of demolition. March 2006 - Repair work is taking place on the bridge carrying the Great Central Way over Braunstone Lane East in Aylestone. January 2006 - The replacement of Upperton Road bridge again looks likely. January 2006 - The demolition of Braunstone Gate bridge is delayed. January 2006 - The replacement of Upperton Road bridge is in doubt. July 2005 - Added update about the future of Braunstone Gate bridge. April 2005 - Added two photographs of trains between Leicester and Rothley in 1967 to the Old Photographs - Trains section. April 2005 - Added photographs showing the rear entrance at Leicester Central station. February 2005 - Proposed timing of the demolition of Upperton Road bridge. February 2005 - Proposals by the Leicester Regeneration Company for redeveloping the Leicester Central Station site and the surroundings as the “Waterside Area”. November 2004 - Demolition of part of the north viaduct has been completed. October 2004 - Demolition of part of the north viaduct has started. October 2004 - Redevelopment continues at West Bridge, and rails have been removed around Upperton Road bridge. May 2004 - Some minor updates and links brought up to date. January 2004 - Added link to “Bridging the Gap” web site with full details of the proposal for bridging the gap between north and south preserved sections over the Midland Main Line at Loughborough. January 2004 - Photograph of apartment buildings under construction on the engine shed and wood yard site. December 2003 - Two new pages added to the Old Photographs section. One with photographs in south Nottingham, mainly of demolition, and the other with a few photographs in north Loughborough including a train on the chord line. December 2003 - Upperton Road bridge to be demolished. October 2003 - Added a photograph of the Great Central station generator house, and a link to The Transport Archive site. August 2003 - The proposed site for a marina has been moved from the Central Station site. August 2003 - Completion of the first building of the Freemens Meadow development, on the site of the engine shed and wood yard. July 2003 - Council decision to demolish Upperton Road bridge. January 2003 - Redevelopment of Leicester Central engine shed due to start in early February. November 2002 - Proposal that most of Leicester Central Station site is replaced by a marina connected to the river & canal. October 2002 - The condition of Upperton Road bridge is being surveyed to see if it can be repaired or if it will need replacing. July 2002 - Planning permission granted for building on the site of Leicester Central engine shed. May 2002 - Proposal by De Montfort University to build a swimming pool which would lead to Braunstone Gate bridge being demolished. End of 2001 - Belgrave & Birstall station master’s house demolished. If you intend tracing this route on the ground please read the Notes For Visitors section which has important information. Historical Notes on the Great Central Railway. The Manchester, Sheffield, and Lincolnshire Railway operated in the north of England in the 19th. century, principally around the areas mentioned in its name. Under the dynamic leadership of Edward Watkin it built a “London Extension” from Annesley, north of Nottingham, to a terminus at Marylebone in London, which was opened in 1899. To reflect this its name was also changed to the more grandiose Great Central Railway. This was to be last long distance main line railway to be built in Britain for a century until the Channel Tunnel Rail Link. In contrast to some earlier lines from the north of England to London the GCR London Extension was able to take advantage of the technology then available such as steam excavators. The result was a line which strode across the landscape with viaducts and cuttings to give a maximum gradient of 1 in 128 (0.78%) without sharp curves or level crossings (grade crossings). This allowed for very fast trains services, both passenger and freight. The line was also built to a more generous loading gauge than normal for Britain since it was Edward Watkin’s intention that it should link up with a Channel Tunnel, which at the time never progressed beyond trial borings, and allow through running with the larger rolling stock of Continental Europe. However, apart from the towns of Nottingham, Loughborough, Leicester, and Rugby (which all had other railway companies with competing services to London) it passed through nowhere of any size, though did have a valuable cross country connection through Banbury to the south coast and south Wales. At the grouping of the railway companies into the “big four” companies under government instigation in 1923, the Great Central Railway became part of the London and North Eastern Railway (L.N.E.R.). However, the L.N.E.R. had a more important main line from the north of England to a London terminus at Kings Cross, and the Great Central London extension thus became a less important duplicate route. As part of the, by then, nationalised British Railways (BR), the fortunes of the former Great Central Railway took a nose dive in the late 1950s when it was split between two regions of BR, the Midland and the Eastern regions. This resulted in neither region promoting traffic on the London extension and it was seen as superfluous with traffic being run down through the early 1960s. In 1966 through traffic on the London extension ceased. The line was closed and the track was lifted from Rugby to Calvert (to the northwest of London). A shuttle service then ran from Nottingham Victoria (but latterly Arkwright Street), through Loughborough Central and on to Rugby Central, before this service too was withdrawn in 1969. In the final months enthusiasts and other concerned people got together to explore the possibility of buying this last section with a view to continuing running commuter trains from Nottingham to Rugby and operating preserved steam locomotives. The Great Central Railway plc between Leicester North and Loughborough Central. For details see www.gcrailway.co.uk. The Great Central Railway (Nottingham) Ltd. between the northern outskirts of Loughborough and Nottingham Heritage Centre (at Ruddington, to the south of Nottingham). For details see www.gcrn.co.uk. These two railways are separated only by a gap across the Midland Main Line of Britain’s main railway network, to the north of Loughborough Central station, where a bridge and embankment were demolished in the late 1970s. There are exciting plans to replace these to make one long preserved railway - for details visit the “Bridge to the Future” web site, and see the “Bridging the Gap” page here for photographs showing the latest progress. The track bed south of Leicester North all the way to Calvert (north of London) has been sold off and much is demolished and built over. Likewise with the track bed north of Ruddington and northwards through Nottingham.